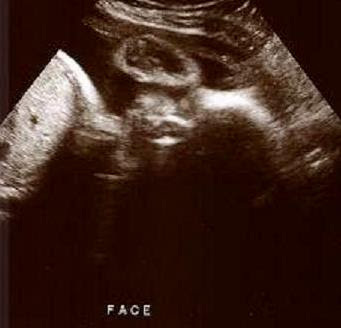 Staring at the 'camera' -- you can see all of her facial parts here! and someone sang "I am woman"? 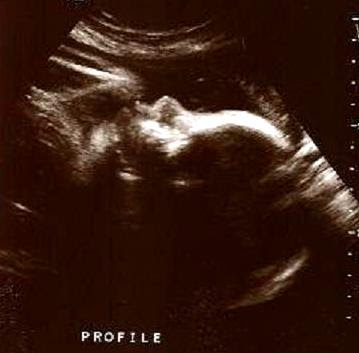 We had a great sono yesterday--everything looks amazing! Our little gal weighed in at 3 lbs, 13 oz, which is almost exactly the size of all of our boys at this point. She is beautiful...we definitely have a case of love before first site *grin*. Haaa, the picture where she is looking toward the "camera", she actually looks like she wants to say something. :) Great belly photo too! soo exciting! you both look beautiful! I can't wait to see her Devin! She is going to be beautiful...and you look GREAT! 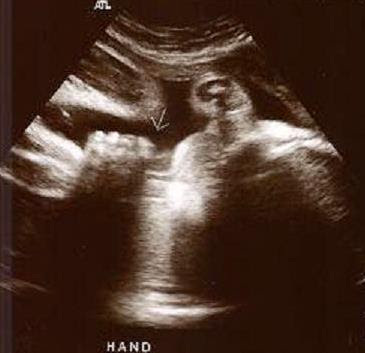 I can't believe she will be here that soon. She looks great. Do you have a name picked out, or are you waiting to see her face first?? And you have really cute maternity clothes! You, as always, look super! She looks like she will be a cutie! I was 32 weeks with Noelle at exactly this time. Yipee, not long now! 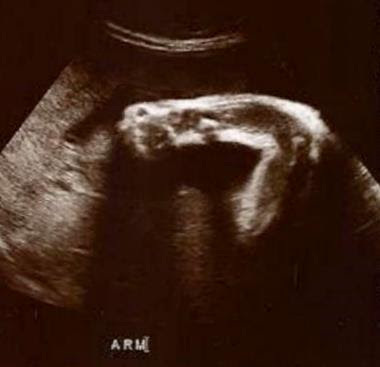 Glad to hear that the sono went well! The pictures are just adorable! How exciting to be getting so close! I just can't believe it! I didn't realize that you were due on the 23rd. That is Dave's birthday! We were due on the 25th with the girls, and I was induced on the 10th! So glad that you posted your pics! So great! I'm so excited! You're on the homestretch girl and looking beautiful as ever! Cannot wait to 'meet' you sweet babe!